The entire system of the DM 606 mini mobile screening system is collected on a single platform and can be transported by many vehicles such as trucks, trucks, tractors, land vehicles. Designed for shortly installation .It can do alone the work of classical plants . These are currently the most preferred machines in the World and Turkey market. It is 800 mm wide and foldable type. A side scraper system is available to prevent spillage of the final product into the stock area during casting. By means of the sputter collecting system, material drop is provided around the groove. 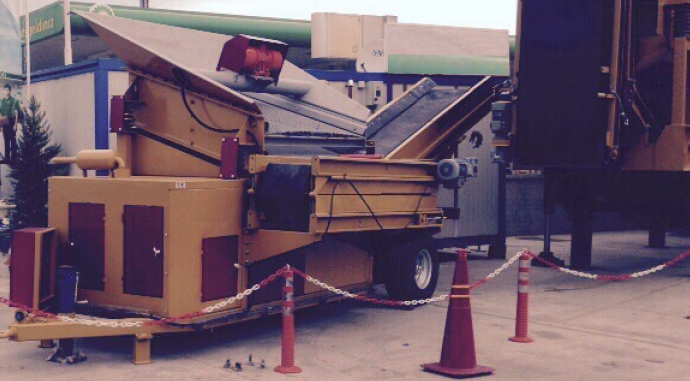 The two stock conveyors are all folding type and have a large under-sieve stock area. A total of 2 products can be obtained from the mobile screen system. 400 mm wide folding type. It is equipped with single axle, air brake and signaling system. Special heavy duty construction chassis. There is a manually adjustable foot mechanism. – The dust suspension control system prevents dusting by spraying the high pressure water nozzle to press the dust on the main conveyor. Capacity is variable according to the material feed and final product. Dimensions to be broken and It is 30 – 80 tonnes per hour capacity. – Extra stock conveyor (Optional) .